Punakha is a Western Bhutan District, few degrees warmer than the other western districts of Thimphu and Paro. Punakha was the ancient capital of Bhutan, and till now, it still serves as the Winter Residence of the Monk Body of Bhutan headed by the Chief Abbot, the “Je Khenpo”. -Punakha Festival is held in the Punakha Dzong(Fortress) which was built in 1637 AD without a plan laid down anywhere. Punakha Dzong was conceived in a dream and built from the mind by the founder of Bhutan, Shabdrung Rimpoche. -Punakha Dzong is very significant in Bhutan’s History as it was here in 1907, that Bhutan’s first king was enthroned and crowned and the Wangchuck Dynasty was born as the rulers of Bhutan hence forth. 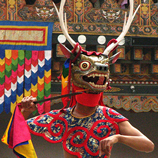 Punakha Dromche/festival tour will take you through, Paro, Thimphu, and Punakha. -You will witness the Punakha Festival in the Punakha Dzong, which is situated at a confluence of two rivers. 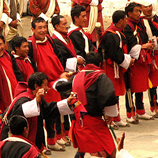 -Punakha Festival Tour Itinerary has been made as a 10 Nights Tour Itinerary; however Guests can programme and plan their tour accordingly to suit the number of days they will be traveling to Bhutan. Day 2: Hike to the Kila Goenpa(Monastery) situated above the Paro Valley. Day 3: Thimphu Sight seeing. Day 4: Day hike to the Phajoding Monastery. Day 5: Thimphu To Punakha. Day 8: Phobjikha Valley Day Trip. Day 11: Early breakfast at the hotel and drive to the Paro Airport for departure.